Monday Made It – some spooky fun, a pop of color, and long distance friends! Wow…. the first quarter finishes up this Friday. It’s amazing how fast the school year flies by! It’s so hard to believe that Halloween, Thanksgiving and Christmas are so incredibly close. I’m actually pretty giddy for the holidays – LOVE to create fun things for them! They aren’t here yet though, so how about I show you what I’ve been up to over the last month! MMI #1 has become a tradition with my students! Not a yearly tradition….a seasonal tradition! Check out the 10 seasonal relay templates I have , in addition to a freebie, and some math content ones too! The relays in my classroom are just a creative way to make review more fun. .For this activity, I usually set up groups of four. Each student is assigned a problem number (1, 2, 3, and 4). At the front of the room, set up a sheet of large construction paper, poster board, or something tangible they can draw on easily. I usually allow my students to create fun names for their team and I write the name at the top of each paper. (read more about the team names here). 1. Each group starts on the first “round” (there are 10 total). 2. Each group member must answer their assigned problem (example person 1 answers problem 1, person 2 answers problem 2, and so on.) — I sometimes change this up depending on the class. 3. After each member has answered their problem, the students should follow the directions at the bottom (i.e. who should bring the paper to the teacher to get it checked AND who should draw their part of the seasonal image). . I tell the students they do not have to make a traditional “monster, frosty, pilgrim, etc…” and to have fun with their designs! 4. After one round has been completed and the seasonal image piece has been drawn, the team moves to the next round. It is very possible for each team to be on a different round. If a team misses a problem, hand back the papers and make them find their mistake. Often times, they find it very quickly. They may ask their group to help if necessary. 5. There are 2 winners – 1) the team that completes the relay the fastest and 2) the team that creates the most “artsy” monster as voted on by the class. The second award is crucial… it keeps all teams in the relay until the end – even if they aren’t fast! Here are some of the spooky monsters that were produced! As soon as I got in the car, I told my MIL that I knew where I was going to put it… in between my two fun chairs in the front room. But…. I told her it was a bit too rustic for my taste and it was going to need some fun color added to it. She agreed. I was so excited when I got home, that I intermediately removed the hinges and started working on it. I decided it needed 3 things…. 1) a fun inside color and a fun, and different, outside color… 2) chunky feet…. 3) new hardware. This is a close up of my chair… the colors seemed obvious to me… blue and yellow! So, I walked over to MIL’s house and told her I was going to Lowe’s. She laughed and said to check the garage first. She had 4 shades of blue and 5 shades of yellow. I was able to grab two pints that matched almost perfectly and head back home. The yellow inside took about 6 coats. Yellow is such a hard color to saturate. The picture below is after 3. Then I added the fun blue! Blue only took 2 coats and because there were no weird corners to deal with, I could use a mini roller instead of a brush! Over the course of the next week, I painted the door, and purchased new, chunky legs, and a sleek, yet geometric new door pull. …and a board nailed in to allow the legs to be screwed into place…. …and the cute legs were attached! Then I added the pull and flipped it over and VOILA! The next day, when it was bright enough to see, I added it to the front room. I can’t wait to get some fun goodies to put inside. I also want a really fun lamp to go on the left…. I’m thinking I may be making something to go there very soon! This summer, I worked with 4 Teacher-blog friends to do a book study. We have since began a monthly link-up called Math IS Real Life. As a thank you to all they helped me with…. 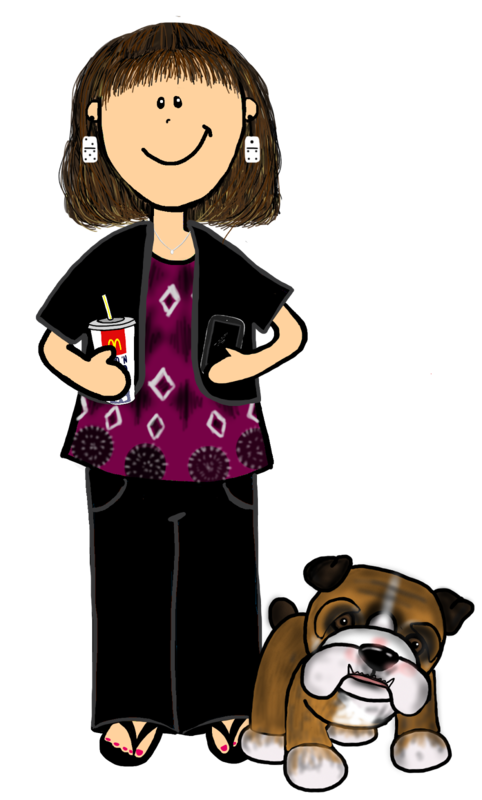 and for dealing with my crazy collaboration ideas… I contact Crystal Fox and had her create a Mini-Me for each of them. Jennifer F. already had a Mini-Me created, so I just asked Crystal to send me a copy of her’s so that I could use it. Instead of having Crystal put together to collage, I paid for 3 individual “Me’s” so that each could use their “me” whenever they wanted to. Once I received their images, I created a cute background and sent the .png to Shutterfly to have it printed as a 5×8 picture and mailed it to each of them. LOVE how it turned out. Here’s how mine turned out…. LOVE!! And…. I almost forgot! A HUGE thank-you to 4th Grade Frolics for the link-up! The holidays are around the corner and that always means SUPER FUN creations around here!…. Until then, happy creating and thanks for reading! Categories: computation and estimation, holiday, mathematical engagement, and Monday Made It. Wow!!! All this looks Fantastic! You have been BUSY, BUSY, BUSY. Thanks Shannon! It was a lot of fun. I can’t wait to start creating for the holidays! I love your new piece that you painted and put in between your chairs. So bright and festive! Thanks so much, Alison! I really love how it turned out! Great stuff! Love the pop of color with the cabinet! I LOVE your cabinet!!! It turned out so great!!! Super stinkin’ cute! I have my photo right here on my desk and I see my friends everyday when I work. 🙂 Thank you!